SANTA FE — Gov. 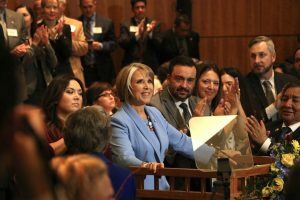 Michelle Lujan Grisham, addressing the New Mexico Legislature on Tuesday for the first time as governor, initiated the 2019 legislative session with a state of the state address focused on responsible, essential investments in public education, public safety, health care and economic development. In her remarks before a joint session of the 54th Legislature, the governor emphasized these shared priorities with the Legislature and highlighted key aspects of her FY2020 executive recommendation, issued last week, including $500 million in additional investment in public education. “I firmly believe what we accomplish in these sixty days will set the course for a transformed state, a stronger and better state, not just in these next four years but for decades, generations to come,” Gov. Lujan Grisham said in her remarks. The governor also expressed optimism about the potential for a renewed spirit of congeniality and collaboration at the Capitol, with two branches working together and reminding New Mexicans how positive, productive working relationships can foster good governance. The full text of the governor’s remarks, as prepared, is included below, for reference. In this moment, on this new day, we stand together on the precipice of immeasurable opportunity. I’m ready to begin the climb — and I know you are too. Esteemed members of the House of Representatives and New Mexico Senate: There’s sixty days of hard work ahead of us. Sixty days — and each one of those days represents the chance to make a meaningful, positive difference in the lives of every single New Mexican. Sixty days is a long time. A lot can happen. I might even start to like some of you. I firmly believe what we accomplish in these sixty days will set the course for a transformed state, a stronger and better state, not just in these next four years but for decades, generations to come. This, right now, is the beginning. This, right now, is our moment. And I am humbled and honored to be a part of it, and to share it with all of you. I know, in this first session of the 54th Legislature, we are going to remind New Mexico what it looks like when a governor and lawmakers commit to working together, commit to working through our differences and the challenges we face with open hearts, with open minds, and with understanding for the person sitting across the table, or across the aisle. Together, we are going to show New Mexico how much good can be done when our two branches of government communicate clearly with each other, when we do the hard work to find consensus, when we win with humility and lose with grace, when we express our disagreements with civility and we always, always keep the honest, hardworking people of this state foremost in our thoughts. I want every New Mexican out there to hear me now: Get excited. Stay excited. Get active and stay active. Please, raise your voices, and raise your hopes, and hold them up high. And I want you, esteemed members of this Legislature, to hear me when I say: The eyes of this state are upon us. Each of you must work for your constituents. In this moment, and in the months ahead, we must also work together for the larger constituency of New Mexico, this magnificent state we are all so lucky to call home. It has been said that those of us who won office this fall had some pretty good timing. It has been said that we are all entering office at an opportune moment. I agree. But this moment is greater than the state of our budget, or any of the numbers that suggest we can now begin to make the transformative investments our schools, our economy and our communities have always deserved. I believe this is an opportune moment, perhaps the greatest moment of opportunity in the history of this state, because we have the strength, and the vision, and the willpower to deliver together. The state of our incredible state is enthusiastic, ambitious, and ready. I know you all share my optimism about this moment. And I believe you share my conviction that when we commit to doing the people’s business, our potential, and the positive change we can make for this state, is absolutely unlimited. Responsible, game-changing investments have been waiting to be made for years, decades in some cases. Our shared priority is progress. We have every tool at our disposal, right now, and it’s time to begin. When I unveiled my budget last week, I showed you I meant what I said in my inaugural address. We are aiming high, and I invite you to aim high right alongside me. We are going to deliver a moonshot for public education in the state of New Mexico: A half billion dollars for our classrooms, new money, put to its best possible use, right now. The transformation starts on the front lines, in our schools, in each and every classroom. For too long, the educators of New Mexico have been underpaid. On too many occasions, they have had to reach deep into their own pockets to buy necessary supplies for their students. Things can and will be different, and better, starting now. We are going to raise our educators’ salaries by 6 percent across the board. And on top of that we are going to raise the minimum salaries for every level of educators by at least 10 percent. And we’re putting $5 million into a fund for teachers to buy supplies for their classrooms – so that they are no longer paying out of pocket. We are raising our principals’ minimum salaries and instituting a $12 minimum wage for every level of educational personnel — everyone in the school buildings. We do this because we will no longer just say we value the professionals in our schools — we will show them. We need our educators, who are truly the best in the nation, to know this state will support them and treat them with the respect they deserve and have always deserved. We need our diligent, professional school workers to know this state recognizes the impact they have on our children, on our future. No more lip service. We are putting our values into action. When we commit to paying our educators and school personnel more, we show them they are wanted here, that they are needed here — and that we know they are on the front lines of change in this state, and will be compensated like it. To truly and meaningfully transform public education, we must be proactive, and we must begin at the beginning. The research is unanimous and unequivocal: Children who attend preschool are far better prepared than those who don’t. It’s really as simple as that. And we can make that a reality for every single New Mexico three- and four-year old. As if that weren’t enough, research has also shown children who come from poor and disadvantaged families have the most to gain from preschool — as do dual-language learners and Spanish-speaking children. This is not a discussion to have in the abstract: These are real children, in our state, who need a better start, right now — a better start this state can provide for them, every single one of them. And so we will provide for them. Together, we will do this. This is the session, this is the year, this is the moment we put New Mexico on the path to universal pre-k for every New Mexico child. We need the classroom slots, we need the educators, and we need the educators who will educate the educators. My budget calls for investing $60 million in new pre-k classroom slots so we increase our statewide enrollment to 80 percent within the next five years. And that includes money for early childhood educator scholarships, so that we are proactively building and supporting the next generation of top-flight educators in this state. We may disagree on how we get there, but we all recognize that early childhood education is the foundation of everything else we want to achieve for our children and our families. We need to target our resources to communities that are currently underserved. Our most vulnerable populations need us to deliver. I intend to eliminate the term “achievement gap” from our vocabulary — because it is within our power to close those gaps, and ensure that every child, every student, every young adult in New Mexico has every opportunity, no matter where they come from. That is why I have proposed an almost 200 percent increase in our Indian Education Fund. Our Native American students will not be left behind. And an additional $55 million for our bilingual and multicultural programs, training more dual-language qualified teachers and ensuring bilingual families will not be left behind. Together, we will hold up this state’s diversity as our strength and our lifeblood. Let our unique multicultural identity be a shining light for this country. Let us show the world how inclusion and empowerment make all of us stronger. And I call on this Legislature to explore every possible viable approach for educational empowerment, including a proposed constitutional amendment that will allow us to take a responsible pinch of additional money from our Permanent School Fund, ensuring we can deliver an education system that works for every child and every family in this state. The time is now. The people of this great state know that investment in our children is an absolute imperative. A judge in Santa Fe has ordered us, all of us, to adequately provide for our at-risk students. But I didn’t need to read a judge’s order to know we can do more, we can do better, and that, in fact, we must. On this, we can all agree: No New Mexico student should ever fall through the cracks. We must seal those cracks, and we will. Together, we will do this, and our communities will grow stronger. I want our educators, our students, and our parents to hear me now: There will be no more high-stakes testing in the state of New Mexico. My first executive orders put us on a path toward a more effective evaluation system and away from the harmful legacy of PARCC. I ordered our rejuvenated Public Education Department to leverage the expertise within our communities by building a new assessment system from the ground up with the direct input of our students, our teachers, our school administrators and our community experts. From now on, we will emphasize teaching, not testing — and the result will be a new day for education in New Mexico. And I want our educators, our students and our parents to hear me again: We will do everything in our power to ensure safety in your classrooms, in your community libraries, in your homes and public spaces. We all have a Constitutional right to be safe in our communities. Four hundred New Mexicans lose their lives to gun violence every year. That is four hundred too many. Four hundred souls, four hundred futures, four hundred of our neighbors. Our Department of Health will conduct a thorough study of gun violence, and we will get the data we need as quickly as we can, but right now we will also take action where we know we must. That means when this legislature adjourns, I expect to sign a bill that will ban those convicted of assault from purchasing or possessing a gun, I expect strengthened background checks, and I expect tighter restrictions on safekeeping to ensure children do not have access to guns in the home. With common-sense reforms, we can build a state where people who should not have firearms, don’t, simple as that. Hunters, sportsmen and responsible gun-owners also recognize the need for New Mexico to take steps toward smart, fair, and effective gun violence prevention, and New Mexicans from every corner of the state stand with them. Gone are the days where we settle for slogans, where we would rather look “tough on crime” than actually do the work to be smart on crime. Instead, we will empower our local public safety officers to enact community policing reforms, and we will build solutions to the drug addiction epidemic while holding bad actors accountable. Intelligent, evidence-based criminal justice reform is our pathway forward, and our pathway out of the violent crime that afflicts too many of our neighborhoods. As we recognize our public safety officers who pour their heart and soul into their communities, we also must recognize that those officers need a raise. By aggressively pursuing federal grants, and responsibly using the money we have, we can implement proven recruitment and retention incentives and ensure every community in this state has the number and quality of officers it needs and deserves. When we are smart on crime, we stay focused on repeat and violent offenders, domestic abusers, repeat drunk drivers — not the low-level and non-violent kids caught in a bad spot. We cannot give up on those kids. For those struggling with addiction within our criminal justice system, we must provide treatment. We cannot give up on someone with a disease, a disease that is all too often linked to bad circumstances, not bad character. We will be tough on the worst criminals, smart about investments and priorities and never stop fighting to make our communities safe. This will be the session where we begin to win the fight against the scourge of opioid addiction in our communities. Under my proposal, we will boost prevention programs throughout the state, we will boost the availability of overdose-reversal drugs, and we will enhance intervention and addiction treatment services. We will also crack down on the prescribers and pharmaceutical companies who do not follow the law, holding those who have unleashed this epidemic into our communities accountable. We will be tough, smart, and we will proceed with empathy for the families caught in this crisis. I will direct my Health Department to adopt the longstanding recommendation from the Medical Cannabis Advisory Board to include opioid addiction as a qualifying condition. We will not stand in the way of our neighbors who are struggling with addiction and want to recover. Instead we will help them all along the way. When I spoke with New Mexicans every day over the past two years, and frankly well before that, I heard their concerns about their health care. You have heard them too. Nowhere is this concern greater than with our behavioral health system. We may disagree from time to time about the size or role of government, but I think we all share the belief that it is a duty of the state to provide for those with mental illness, those dealing with substance abuse and their families. And we absolutely have the capacity to do so. This is basic humanity — and we will rebuild that health system, brick by brick, together, starting this session. In this session and in the coming years, when we explore strategies that will reduce cost and increase patient access, I want us to emphasize improved patient care, better health outcomes and building sustainable relationships between patients and providers. To that end, I have directed the Department of Health and the Human Services Department to work with the superintendent of insurance to reduce reporting requirements and burdens on our health care providers. The message to providers and patients is this: Better delivery over bureaucracy. Our providers should spend more time taking care of their patients, and our patients should spend less time worrying about what they can and can’t afford. And let us show the women of this state that we will not allow faraway federal judges to determine autonomy over their bodies. The old criminal abortion law of this state, one of only nine left in the country, must go. Bring me that bill. I will sign it. I have outlined how we can begin to address the vacancies at our Children, Youth and Families Department. Under incredible new leadership at CYFD, we will finally be proactive in protecting our vulnerable children — 100 new positions in the Protective Services Division. When this legislature adjourns, I expect bills on my desk that will deliver a jolt of new energy to child well-being in this state. In the meantime, our reinvigorated Children’s Cabinet will work with key departments to ensure needs are being met, and that we are at the forefront of innovations in service. And I applaud Mayor Tim Keller for recently announcing a similar sort of idea – I encourage all public officers in New Mexico to consider how we can come together and leverage our respective positions and resources to deliver a turnaround on child well-being in the state. Together, we will get it done. Speaking of things we will get done: Bring me that rocket docket! These bills, which some of you worked so hard on in the recent past, include good, productive ideas for this state. Support for our land grants and acequias. A bill to support our farmers and ranchers engaged in value-added agriculture. A bill that will make grants available to nonprofits that provide legal services to low-income New Mexicans. A bill to support mid-wives in rural communities. Common-sense changes to lobbyist expenditure reports to enhance transparency. These are measures that show we are taking the opportunity now, this session, to make positive change a reality. And as we do the work to make this state a better and safer place to live and raise a family, we will also be aggressive in making New Mexico a better place to work and do business. Finally building a broader economy that works for all New Mexicans requires boldness from us in this session. That means, starting now, the workers in New Mexico who earn the least will know dignity in their work. More than 110,000 New Mexicans make $7.50 an hour. This is a poverty wage. And I do not intend to lead a state where we simply tolerate poverty in our communities. These are our children. These are our neighbors. These are members of our extended New Mexico family. No one who works hard in this state will be left behind — which means we will send a very clear message to New Mexico families by making $7.50 an hour a thing of the past. Ten dollars now, 12 dollars soon, and an index to inflation so the rate is fair forever after that. Women in this state will see equal pay in my term in office. New Mexico can and will be the national leader on gender equality. For our tireless state employees, I have proposed tiered raises, so those who currently earn the least will see 4 percent raises, and the minimum wage for state employees will rise to $12 an hour beginning on July 1. Let’s make this happen. I have also proposed an expansion of the Working Families Tax Credit, which we know creates a ladder out of poverty, providing child care programs so parents can continue to get meaningful support even as they do the hard work to transform themselves and their family’s fortunes for the better. These are the New Mexicans we most need to invest in: The New Mexicans who want something better for their children. We can and will help them on their way. Our local economic development act is a great example of how public-private partnerships can elevate communities in this state — not just cities and towns but groups of people with an idea, committed entrepreneurs, who just need a little help to get going. All across this state, we have seen the positive results of our investments. LEDA works. So, this year, let’s double it. Let’s show our New Mexico business-women and -men that we mean business. Let’s show this country that New Mexico is more than one industry, and let’s show our communities that we know local businesses provide good jobs to local residents and have a cascading positive effect on their street corner, neighborhood and region. And we can further amplify our local businesses by investing an additional percentage point from our Severance Tax Permanent Fund, delivering $50 million straight into homegrown mom-and-pop businesses, enlivening our communities. Meanwhile, our Job Training Incentive Program assists companies across New Mexico, especially those in our rural communities, training workers in high-paying jobs. We can and will boost our homegrown small businesses. Our film and television industry is a powerful tool for economic development — statewide. The flurry of film activity in Santa Fe and Albuquerque can and will spread all over this state, and when we lift the rebate cap the industry in our state will be broader, including our pueblos and tribes, our rural communities, workers up and down the economic spectrum. When productions come here, they put New Mexicans to work — whether you’re on a crew, whether you’re a caterer, whether you’re an aspiring filmmaker of your own and you need a foot in the door, an apprenticeship, an opportunity to start making your mark. These film and television productions showcase our great outdoors to a global audience and give young New Mexicans an exciting career ladder. People in the farthest corners of this planet know New Mexico as the Great American West — because of our film industry. And people in the most important offices in Hollywood know New Mexico has the greatest crew base, greatest above-the-line talent, greatest facilities, vistas and scenery in the entire U.S.
Now we have the opportunity in the coming years to accelerate. Filmmakers have put millions of dollars into our local economies. But that poorly designed cap on what we can rebate in any given year has left us with a hefty unpaid tab. In New Mexico, we keep our promises. And now we will build a smarter system to ensure we keep New Mexicans working. I call on you to embrace the aggressive and proactive plan I laid out in my budget: We will pay off the backlog left to us by the previous administration — all of it, this year. Because I want Hollywood to hear me, I want talented young New Mexican writers, producers and actors to hear me, I want moviemakers across the globe to hear me: We are open for business, bring your cameras. I would like to address the veterans who are here and who are listening out there: Thank you. Thank you for your incredible service and sacrifice. I have directed our state personnel office to formulate a policy that will lead to more veterans being hired by our state agencies. And our Department of Veterans Services, under bold new leadership, will be significantly strengthened, playing an active role in the lives of our veterans, from college education to health care to caregiving assistance and more. Our veterans have given everything for us; now it is our turn to give back. Thank you, again. When I was secretary of aging, I had the privilege of learning directly from tribal elders about tribal sovereignty and the importance of government-to-government relations. Under this administration, we will see a full restoration of positive, collaborative relationships between the state and our tribes. We will rebuild an effective inter-governmental framework by working directly with the sovereign Native nations of New Mexico. No more disregard, no more disrespect. Let us begin renewing these essential relationships, starting today. Let us also take the time in this session to recognize our infrastructure needs — and to act with the sense of urgency the situation demands. Too many of our bridges are rated structurally deficient. Too many of our roads are in bad shape, endangering drivers, even cyclists and pedestrians. We have improvements to make to our water systems, our dams, our school buildings, broadband internet in our rural communities — all of these items need our attention, right now. We have a chance to transform our infrastructure to promote and leverage serious economic development while we address critical community needs. I call on you to work with me in expanding and fast-tracking these investments. Infrastructure is the bedrock of our communities and our state. It is the foundation of the diversified economic growth we all envision. We must make these critical investments in safer communities and a stronger economy. For the thousands of federal workers in this state who have seen their lives unfairly held hostage by this unnecessary government shutdown, this state will step up wherever we can. Indeed, in some ways we already have. While other states are scrambling to preserve federal funds and programs that are now at risk, New Mexico is taking charge and demonstrating proactive leadership amid the chaos. Almost 500 staff members at the Human Services Department have been working overtime through the weekend to ensure tens of thousands of New Mexico families will continue to receive their food benefits. Our Department of Health worked overtime to ensure our Women, Infants and Children program recipients will continue to receive benefits into April. Our Department of Workforce Solutions has waived the work search requirement for the 1,000-plus federal employees who have filed for unemployment benefits, making it a little bit easier for hard-working breadwinners who have it so hard right now. And we will continue to build on this effort as long as the shutdown lasts. Our great outdoors rival any in the world. Outdoor recreation is an opportunity begging for investment. When we install an outdoor recreation coordinator in this state, that office will make sure New Mexico is on the map for bikers, hikers, campers, hunters and fishermen and fisherwomen the world over. And when we boost our tourism marketing campaigns, we will show more of the world how beautiful our state is, and how badly they need to come visit. But if we want to show off our wide-open spaces, we’ve got to keep preservation on the front burner. The U.S. Climate Alliance is a bipartisan group of governors who have committed to upholding the goals of the Paris Climate Agreement, and New Mexico will join it. I will sign an executive order committing us to those goals in the very near future. And I will direct each state agency to participate in developing a comprehensive climate plan for New Mexico that responds to the threat of a warming planet by reducing carbon dioxide and other greenhouse gas pollution. Because we know we cannot rely on the federal government, right now, to lead on climate action. It is our responsibility and indeed our moral obligation to ensure our planet and our state are preserved for our children and their children. I have committed to increasing our renewable portfolio standard — 50 percent renewable energy by 2030 and 80 percent 10 years after that, and I ask you to fulfill that commitment with me. Not as a ceiling but a starting point, with an ultimate goal of even greater renewable production. This is our promise to future generations of New Mexicans. Because clean energy is the future, and we all know New Mexico has the sunshine and the wind capacity to be a global leader in this new era. There are other steps we can take to reduce our carbon footprint and ensure we get on and stay on the right path. Our state buildings can be more energy-efficient. Wasteful methane emissions can be cut, and in the process this state will make more money and more New Mexicans will be put to work. As I have said, this is a rare moment in New Mexico’s history. The ideas we put into action beginning today can truly transform this state, truly reimagine our education system, broaden our economy and our energy sector and help us realize our potential. However, I know most of you, and I know you have your own ideas, policies, proposals and programs to move New Mexico forward. I recognize that many of you may share my enthusiasm but not my exact roadmap for how we move ahead. I get that. In the sixty days ahead, I promise you this: I will listen as much as I talk. Really, I promise. I want to learn from you and incorporate as many of your good ideas into mine, into solid legislation and policymaking for New Mexico. We will be bold and prudent. We will be aggressive and smart. We will be fearless and well prepared. Above all else, in this forthcoming period of hard work and beyond, let us remember the people who sent us here. Let all of us, Republicans and Democrats, keep in mind, all through these long days and nights, the New Mexicans we are here to represent. The children who deserve the best possible educational system; the educators who deserve the best possible institutional support; the families who deserve safety and prosperity; the workers who deserve the chance to work their way up; the veterans, police officers and firefighters who deserve our gratitude; the small-business owners who deserve our support; the New Mexicans who simply want to see their vision of a healthier, happier state come to fruition. We are those New Mexicans. In this room, there are educators, there are public safety officers, coaches, doctors, lawyers — a lot of lawyers, actually. Together, we can and will show New Mexico and this country what good government looks like. We can and will serve as a reminder that progress happens collaboratively. We can and will do the work to make this Day One of the brand new Nuevo Mexico.